There's no denying the untitled young Han Solo film has had more than its share of problems. Back in June, directors Phil Lord and Chris Miller were fired, despite having been working on the film since 2015 and shooting since January, and replaced by Ron Howard (who is still at work on principle photography). The news was a shock to Star Wars fans and, apparently, to members of the cast. Donald Glover, who plays Lando in the film, spoke with The Hollywood Reporter recently and (of course) the topic of the change came up. "Ron is such a legend, and he knows exactly what the vision for what he is doing is … [but Phil and Chris] hired us, so you sort of feel like, 'I know I'm not your first choice …' And you worry about that. To be honest, I don't know exactly what happened. I feel like I was the baby in the divorce, or the youngest child. The oldest child is like, 'We know what's happening, but we are keeping you out of it.' And I'm just like, [Glover's voice rises several octaves] 'Was that scene good? How did you feel?'" I was like, 'I've always felt like this character could do this, and he represents this, and I kind of feel like he comes from here, and it's very obvious he has a lot of taste, so maybe he grew up seeing that from afar? Because I'm like that. Maybe he saw it from other planets and was like, 'I want to be that. He just let me ramble on and on, and then finally I was like, 'So, what do you think?' And he goes, 'Yeah, I don't know about all that. Just be charming.'" You can read the entire interview with Glover here. The untitled young Han Solo film hits theaters on May 25th, 2018 and stars Alden Ehrenreich (Hail Caesar!) 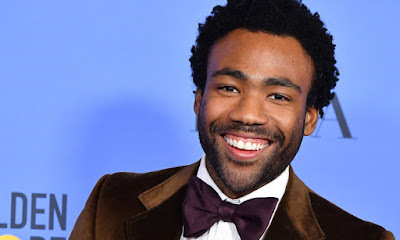 as Han Solo, Donald Glover (Atlanta) as Lando Calrissian, Emilia Clarke (Game of Thrones), Woody Harrelson (True Detective) as Beckett, Phoebe Waller-Bridge (Fleabag), Thandie Newton (Westworld), and Michael K. Williams (The Wire). The film is directed by Ron Howard (A Beautiful Mind), with a script by Lawrence Kasdan (The Empire Strikes Back) and his son Jon Kasdan (The First Time).